Seeking a reliable steel-cased practice round for your trusty AR-15? Look no further than this Silver Bear .223. Silver Bear is made at the Barnaul plant in Russia, and is cased in Berdan-primed zinc-plated steel. 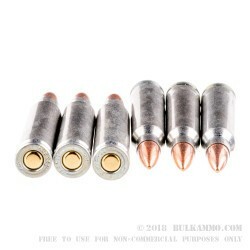 The 55 grain Full Metal Jacket bullet has a lead core with a combination of copper and steel in the jacket. Silver Bear uses zinc to extend the shelf life of the ammo. The company that manufactures Silver Bear manufactures sister brands Brown Bear and Golden Bear. Its origins date back to 1869 when Emperor Alexander I had them open up in St. Petersburg to produce ammunition cartridges for the state military until moving to Moscow during their revolutionary civil war. During World War II, to hinder the supply chain of the German invading forces, they moved the plant to Barnaul where it remains today. Good round but steel core. Granted I only fired about 60 rounds at a public range today. 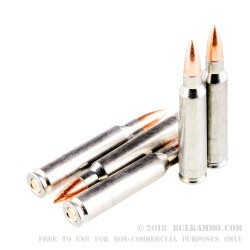 I ordered this ammo simply for shooting fun since 5.56 is more expensive. I've put a couple of hundred rounds of this through my S&W M&P 15 Sport without a hitch. For this price I get to shoot a lot of decent ammo. I did note that the .223 is a lighter load and the barrel doesn't get as hot like it does with the 5.56 and has less recoil. At the range I was hitting a steel torso silhouette at a couple of hundred yards consistently with it, and I liked that. Been doing business with these folks for years now, always the same, fair prices and fast shipping. Been shooting Bear ammo for years also can't go wrong with any of it. I usually get the lacured cases, but this was on sale. Great performance at a Bargain price. A: Hello Jason! This Silver Bear ammunition is new manufacture. As a result, it is loaded with all non-corrosive components. A: Hello Richard, No, these 55gr. 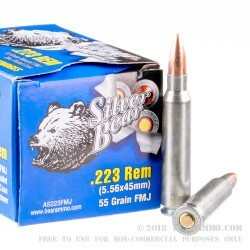 FMJ rounds by Silver Bear in .223 are not reloadable. They have steel cases, not brass.